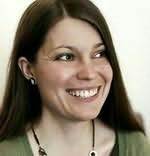 Becky Chambers is a writer and editor. Her work has appeared at The Mary Sue, Tor.com, and elsewhere around the internet. The Long Way to a Small, Angry Planet is her first novel. Born and bred in California, Becky lives with her partner in Reykjavik, Iceland. "Wonderfully adventurous and laudably detailed. Bennis paints airship battles so clearly you'd swear they were from memory." "Come for the exploding spaceships, stay for the intriguing universe."